Wintertime is always associated with the word “quiet” here in our part of the North Carolina mountains. 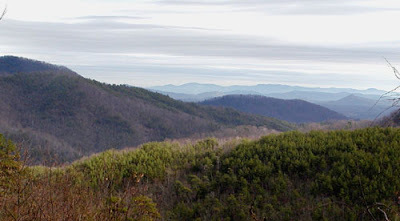 When guests stay at our Bed & Breakfast near Black Mountain and Old Fort during winter, it’s often to engage in some post-holiday stress relief by starting the new year off with some relaxation in the calm and quiet surroundings of Pisgah National Forest. Sit in front of a fire, slumber peacefully, have a great breakfast, maybe get out and do a little walking or hiking on a sunny day (the vistas seen on many trails in the mountains in wintertime are spectacular with the absence of view-blocking foliage), have dinner at a great restaurant without a high-season wait time… Take it easy and enjoy the peace and quiet is what we like to say. From January through March of 2010, you’ll be able to relax in our neck of the woods with our 10% Quiet Season room discount on a reservation of two or more nights. Holidays and weekends included, of course. We’ll be putting together a list of winter activities (and winter hikes) soon, but relaxing is always at the top of the list here at the Inn on Mill Creek! This entry was posted in Uncategorized and tagged Winter by Inn on Mill Creek. Bookmark the permalink. What a beautiful sight. You are truly blessed to live in such a place. Thanks, Sarah. Your place is also beautiful! Happy New Year!